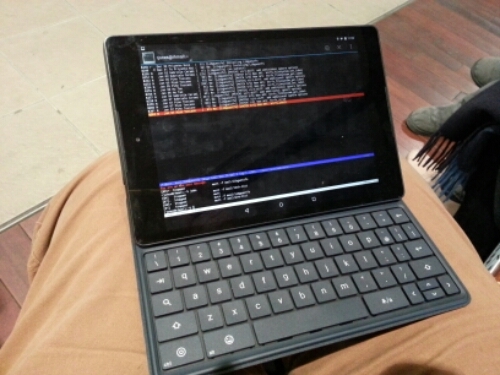 The Nexus 9 is an odd, compromised tablet, and way too expensive, but combined with the folio keyboard & pocketwifi it makes a nice ssh terminal for use on the road. Various ssh apps like ConnectBot have terrible external keyboard support. So I compiled a static dropbear binary and static busybox, and I’m using those with Android Terminal Emulator. The tablet has a 64 bit ARM processor (actually it’s way stranger than that – it uses a proprietary VLIW core with Transmeta-style code morphing in software). I used my AArch64 Fedora machine to compile the static binaries which I copied across. I changed the default shell to busybox ash and added a bunch of start-up scripts to make Android more bearable. It all works except nsswitch (user & DNS resolution) because of glibc static brokenness. nbdkit is a liberally licensed NBD (Network Block Device) server designed to let you connect all sorts of crazy disk images sources (like Amazon, Glance, VMware VDDK) to the universal network protocol for sharing disk images: NBD. New in nbdkit 1.1.8: cURL support. This lets you turn any HTTP, FTP, TFTP or SSH server that hosts a disk image into an NBD server. I’m hoping to enable write support in a future version. It doesn’t work at the moment because I haven’t worked out how to switch between read (GET) and write (POST) requests in a single cURL handle. Perhaps I need to use two handles? The documentation is confusing. qemu 1.5.0 has been released, featuring ssh support so you can access remote disks over ssh, including from libguestfs. drwxrwxrwx  1 root root       4096 Apr 16  2012 .
drwxr-xr-x 23 1000 1000       4096 May 20 19:47 ..
New in libguestfs ≥ 1.21.30 is the ability to use guestfish and some of the virt tools with remote disks. Currently you can use remote disks over NBD, GlusterFS, Ceph, Sheepdog and (recently upstream) SSH. For this example I’ll use SSH because it needs no setup, although this requires absolutely the latest qemu and libguestfs (both from git). The qemu ssh block device is now up to version 7 … although sadly not upstream yet. Everything just works as if this were a local disk. There are a couple of minor caveats (the major caveat being none of this is upstream): Firstly you have to have ssh-agent set up. Secondly the remote host must be in your known_hosts file (if not, do ssh remotehost first to add it). QEMU ssh’es into “host” and opens /path/to/file. For the initial version of this patch you will need to set up ssh-agent access to the remote server. The motivation behind this patch is to allow libguestfs to access remote disks using ssh the same way we already do with NBD. Secure Shell is ubiquitous, so for the majority of users libguestfs-over-qemu/ssh would let them use disks remotely with zero configuration.